The Republic of Guinea-Bissau is a small country of western Africa. Its two neighbours are Senegal to the north and Guinea to the east and south. 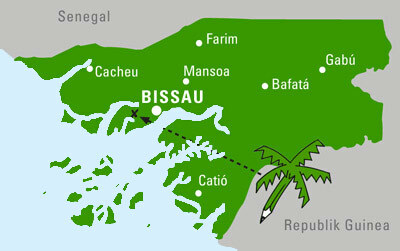 The capital is Bissau. With its 13,948 square miles and 1.75 million inhabitants, Guinea-Bissau is one of the smallest African countries. And it is one of the poorest as well. The average income per capita is 500 Euros per year. In the international poverty ranking of the UN, Guinea-Bissau found itself on position 166 of 175 (2015). The former Portuguese colony achieved its independence in 1973 and is now a presidential representative democratic republic. After numerous political and often violent upheavals and a devastating civil war in 1998-99 the political situation has improved but is far from being stable. Until now no president has successfully served a full five-year term. Two-thirds of the able population are working in agriculture. Only half of the fertile land is being cultivated. Low prices on the world market for some of the typical local produce such as rice make their cultivation not worthwhile. The most important produce is cashews, peanuts and fruits such as papayas and mangos. Foresting and fishing also play a crucial role in the country’s economy. The average life expectancy is around 50 years, which is the third lowest in the world. Portuguese is the official language, but each tribe speaks its own vernacular, which in turn is divided into dialects. The majority of the people follow traditional religious beliefs. Islam is the dominant minority religion. Christianity has made few inroads in Guinea-Bissau. Even in smaller villages people of different beliefs live together peacefully. Education in Guinea-Bissau is compulsory from age 6 to 12 (grades 1 to 6), although barely 55% of children attend the basic level, and just 25% complete the complementary 3 years that follow. As a result of this adult illiteracy remains high especially among the women. Students with promising basic school results may attend secondary school for a further 3 years. Unfortunately, there are few facilities in remote rural areas where teachers may be poorly trained too. As a result, the education system largely fails to deliver to those whom it most desperately needs to serve.